Cuyler’s Harbor, San Miguel Island (Cuyler Harbor; El Puerto de la Posesion by Cabrillo) is on the northeast side of the island, and stretches for about a mile to the east of its western head formed by Harris Point. It is the island’s safest and most popular anchorage. Princess Island (Prince Island) is located within the harbor. 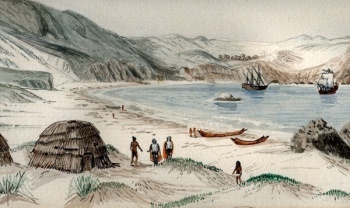 The place name appears on the 1853 U.S. Coast Survey map Reconnaissance of the western coast of the United States San Francisco to San Diego, A. D. Bache, Superintendent; the June 1882 U.S. Coast Survey map Pacific Coast from Santa Monica to Point Conception, including the Santa Barbara Channel, California, J.E. Hilgard, Superintendent. In May of 1896, the U.S. Coast and Geodetic Survey sent the Gedney to rechart Cuyler’s Harbor. In 1937, a stone monument to Juan Rodriguez Cabrillo who may have been buried on San Miguel Island was placed above Cuyler’s Harbor. An additional landslide was reported at Cuyler's Harbor in 1942. 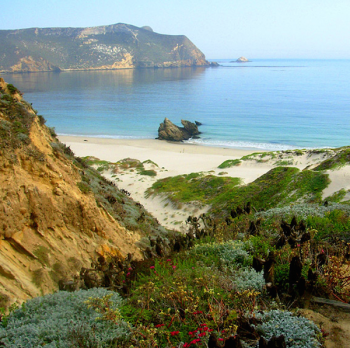 This place name appears as Cuyler Harbor on the San Miguel Island East topographic map. 1895 General William Ward Duffield (1823-1907), superintendent of the Coast Survey (1894-1897), had worked for George Davidson for decades, collaborating with Davidson to create hundreds of coastal views that were engraved for Davidson’s magnum-opus, the Pacific Coast Pilot, 4th revised edition. 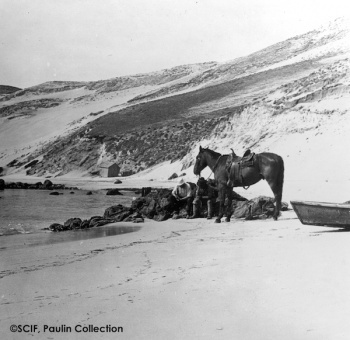 In 1894, some sort of submarine earthquake and possible tsunami had occurred at Cuyler’s Harbor on San Miguel Island. Ferdinand Westdahl (1843-1919) and a crew were dispatched to re-survey parts of the island and the reconfiguration of the bottom of Cuyler Harbor after “The Upheaval” as it was called. Westdahl did a number of sketches from specific points. 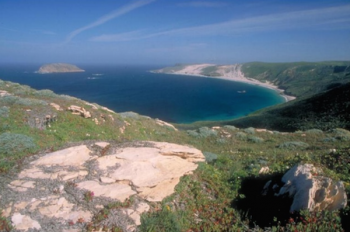 At the end of the work, he requested the ship captain stand offshore from the northern edge of the island and steam parallel to the island coast past the other end of the island as they returned to Santa Barbara. As though it were a final run for old times’ sake, Ferdinand Westdahl used the cruise to sketch what became the very last coastal view, taken from life, ever produced by the Coast and Geodetic Survey.